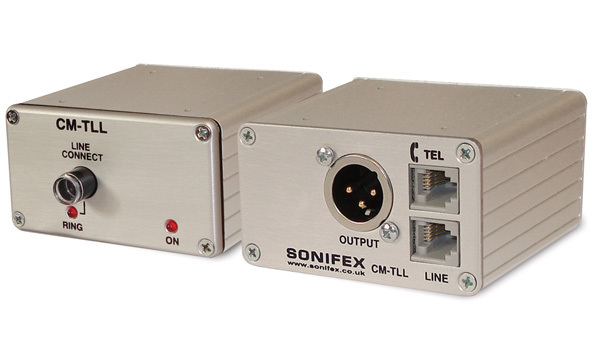 The CM-TLL provides a low-loss interface to receive audio from a telephone line. The line-powered unit is compatible with all analogue direct exchange lines and includes an LED indication of incoming calls. The unit is intended to be used with an earpiece amplifier to receive an audio feed by telephone from a studio. The line and telephone set are connected to the unit via the RJ11 connectors in order to make an outgoing call. A telephone may not be required if calls are only incoming, because telephone line ringing is indicated by a flashing LED built into the unit. In either case, the ‘LINE CONNECT’ switch is pressed to make the line connection. The ‘ON’ LED indicates that the unit is powered and that audio is routed from the line to the XLR plug. Audio interface to direct analogue exchange lines - receive calls with electrical isolation from the line. LEDs indicating ‘Ring’ and ‘On Hold’ conditions. Loop-through line sockets provide in-line connection with existing telephone. Existing telephone remains connected when the unit is in use. Line connections to British or International sockets via supplied cable kit. Small, rugged extruded aluminium case with XLR3 male 4-wire connector.